Previous exploration indicated the potential for a significant gold resource presence at the Mount Adrah properties and in particular, the Hobbs Intrusion-Related gold system (IRGS) deposit which should enable Force Commodities to rapidly deliver resource growth and leverage off its experience exploring for IRGS in New South Wales. Mt Adrah project holds quality tenements around areas of known historic gold occurrences. The presence of high grade gold-bearing strucures proximal to the Hobbs intrusion-hosted gold mineralisation adds a significant dimension to the potential scale and economics of the project. Further high grade gold was discovered in the White Deer Reef, a parallel structure ~50m to the NE of the Castor Reef - 1.2m @ 61g/t Au. Digital plotting of eluvial gold workings and associated quartz gravels shows a concentric zonation of gold occurrence. 29.8 g/t Gold: Old working developed on narrow quartz-sulphide veins in the metasediments enclosing Hobbs Pipe. 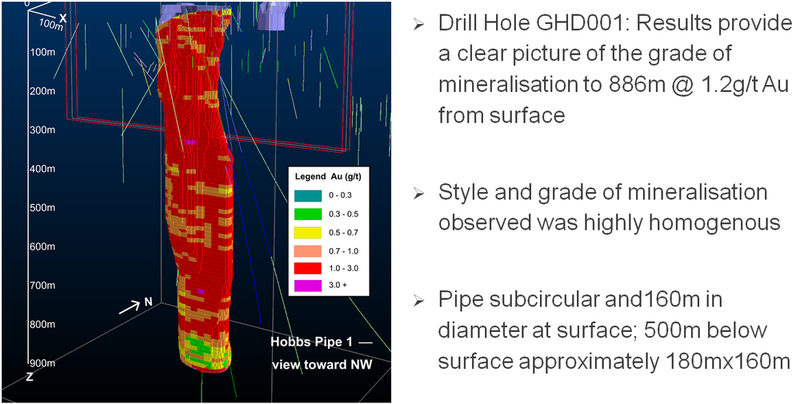 The significance of the existence of narrow, high grade gold zones in the overburden of the potential open cut portion of Hobbs Pipe will be investigated. 24.9 g/t Gold: Historic Mines Nacki Nacki Eluvial, Bangadang area.